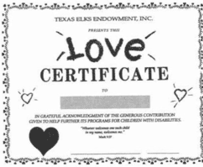 Memorials, honor gifts and special occasion gifts in amounts of $25 or more offering condolences or recognizing birthdays, anniversaries, graduations, and for special occasions such as Valentine's Day, Christmas, Easter or any special occasion. 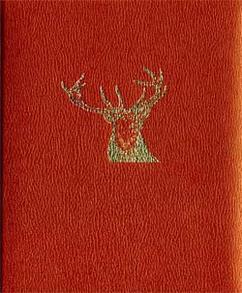 A leather bound booklet with the appropriate insert will be sent to the honoree or family. For Memorial or honor gifts under $25, a card will be sent to the honoree or family. 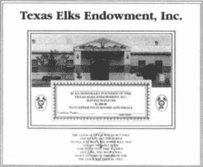 We acknowledge those who made TEEI Endowment Memorial Contributions. 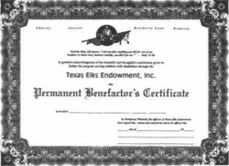 For installment plan options for any of the TEEI certificates please download this form and mail it to the Texas Elks Camp.